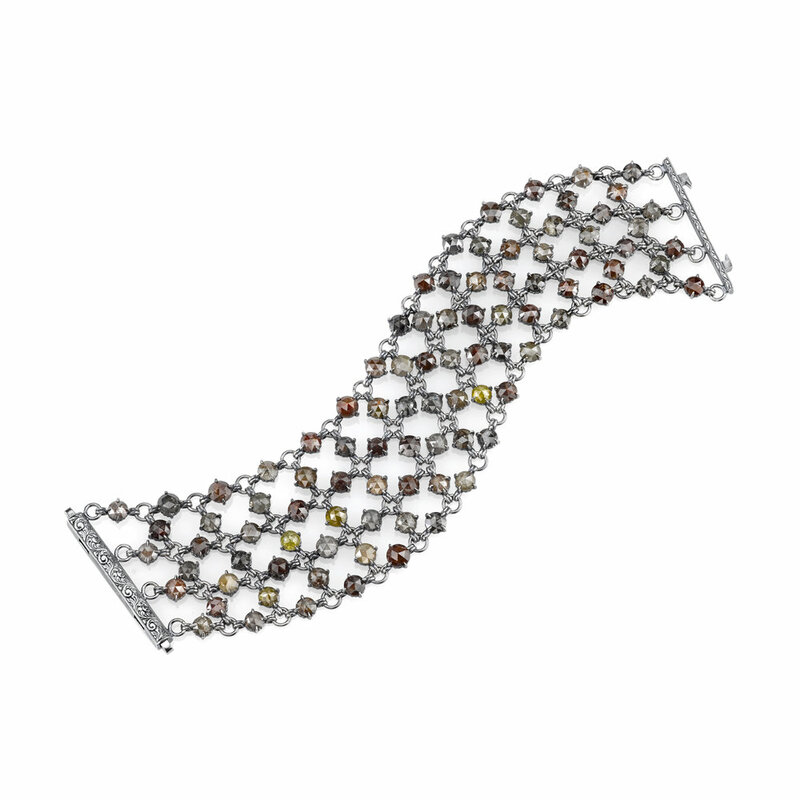 This beautiful bracelet has both modern and traditional elements. Earthy rustic diamonds, a trendy twist on neutrals, pair wonderfully with the muted tones of Organic Silver. The hand-engraved design on the Organic Silver clasp does not go unnoticed - such attention to detail will surely captivate the wearer of this bracelet and all who see it. Each of Michael Barin's pieces are hand-forged using recycled silver, with most pieces being one-of-a-kind. The metal does not contain any added alloys that could compromise the strength or quality of the piece. When asked why he prefers Organic Silver to "regular" silver, Michael says, "it is a form of environmental conservation - we save the planet while creating wearable works of art." 68 Ct Rustic Diamonds set in Organic Silver and accented with Hand-Engraving. This bracelet is 6.75 in long and 1.60 inches wide.